Controlling the local magnetization direction in a thin film without applying external magnetic fields is of considerable interest for designing new sensors and storage devices. A group of researchers from INSP (Croissance et propriétés de systèmes hybrides en couches minces) and from the synchrotron laboratories ELETTRA (Trieste) and SOLEIL (Saint-Aubin) tackled two specific problems : i) demonstrate thermally induced magnetization switching of a thin magnetic layer (Fe) by controlling the surface dipolar fields associated with the template microstructure (MnAs/GaAs) , and ii) achieve temperature control and magnetization reversal by an ultra-fast optical laser pulse . Optically driven and temperature controlled, the process has potential for applications in sensors and devices. The correlated study of the laser induced MnAs structural modulations and of the Fe magnetization dynamics shows that the absorption of a single optical laser pulse can reverse the local Fe magnetization. Both structural and magnetic studies relied on resonant soft x-ray scattering techniques, making use of the most advanced synchrotron  and free-electron laser  x-ray sources. MnAs epitaxially grown on GaAs(001) features a peculiar magnetic and structural behaviour at ambient temperatures, where the coexistence of two phases, ferromagnetic-α and paramagnetic-β, produces self-organized parallel stripes with µm periodicity. 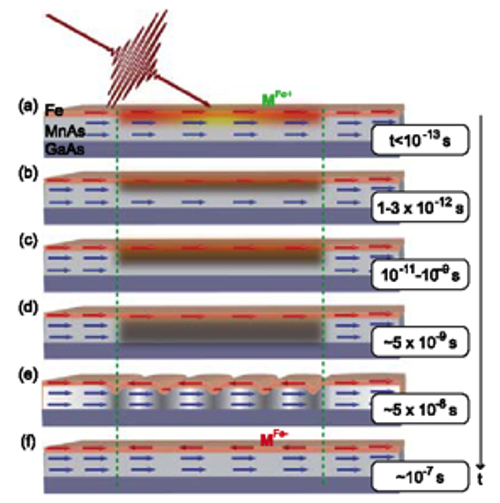 Making use of the temperature-controlled dipolar fields generated at the surface of the MnAs film, one can manipulate the magnetic order in a ferromagnetic Fe overlayer, without applying external fields (Fig. 1). Experimentally, this thermally induced magnetization switching (TIMS) in Fe/MnAs was observed by measuring the resonant scattering of polarized soft x-rays using a synchrotron radiation source . The technique combines magnetization sensitivity with element selectivity, making it possible to probe the Fe and MnAs magnetization separately. Temperature driven Fe magnetization switching (left). At 5°C only the ferromagnetic α-MnAs phase exists (a) ; the magnetization of Fe and MnAs are set parallel by a magnetic pulse, Hext. 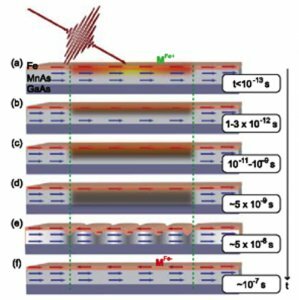 Over the phase-coexistence temperature region (12 – 40 °C), the self-organized striped microstructure alternates ferromagnetic α and paramagnetic β phases (b) ; the dipolar fields extending above the surface switch the Fe magnetization locally. Cooling down, the MnAs recovers its initial configuration, while the Fe layer magnetization has reversed (c). Laser driven Fe magnetization switching (right). Magnetization sensitive specular reflectivity of p-polarized FEL radiation tuned to the Fe-3p resonance. A magnetic pulse saturates the Fe magnetization in the high reflectivity state (MFe+). A single optical-laser pulse (F=10 mJ cm-2, 100 fs duration) changes the reflectivity to the MFe- value, corresponding to the opposite Fe magnetization direction. An ultra-fast laser pulse provides an alternative method for triggering temperature variations, with potential for applications. The research group studied the structural and magnetic dynamics in Fe/MnAs using the short x-ray pulses available at the FERMI free-electron laser (FEL) source. The 100 fs FEL probe, tuned to the Fe 3p resonance, was coupled to a 100 fs optical laser pump . By measuring the probe resonant scattering, it was demonstrated that the absorption of a single optical pulse induces local Fe magnetization reversal (Fig. 1). In parallel, a time-resolved diffraction experiment monitored the MnAs microstructure dynamics and correlated it with the Fe magnetization switching process (Fig. 2). (1-20 ps time range), related to electron-lattice and spin-lattice energy exchange processes, resulting in the formation of a homogeneous paramagnetic β-MnAs surface layer, followed by a slower heat diffusion driven process. Fig. 2 summarizes the proposed mechanism, correlating microstructure dynamics with laser-induced magnetization switching. Sketch of the laser driven Fe magnetization reversal mechanism. The laser pulse excites the electrons (a), the energy is transferred to the lattice within ps (b), promoting the MnAs α→β transition in the interaction volume. The transformation progresses by thermal diffusion (c, d). The Fe magnetization switches when the system crosses the phase-coexistence temperature region during cool-down (e), and then remains antiparallel to the MnAs one at equilibrium (f). Among the perspectives opened by these results, the INSP researchers work now on the extension of dipolar field assisted TIMS to other materials, notably to the ordered FeRh alloy, which is antiferromagnetic at ambient and ferromagnetic above 90°C. Nanostructuring of the Co/FeRh system offers interesting opportunities for Co magnetization magnetization in a thermal cycle, possibly triggered by a laser pulse. Scientific Reports 5, 8120 (2015). Physical Review Letters 113, 247202 (2014).